Weaving through the throngs of boats anchored off Annapolis, Maryland, on the 14ft Topaz CX14, I felt like a kid again—a really giddy kid who had just scored a ride on a the coolest boat in the harbor. A product of Britain’s Topper, which first made a name for itself building dinghies, the Topaz is not your standard beach cat. 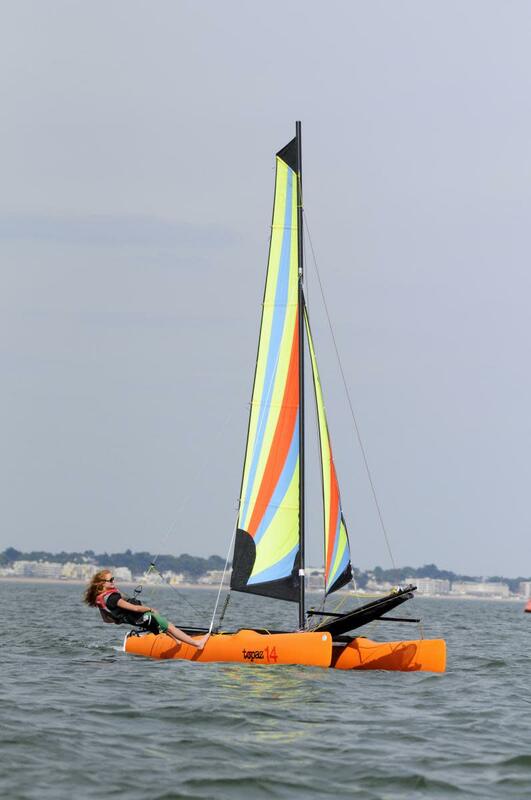 Designed by international multihull racers Yves Loday and Robert White, the boat features dual lifting rudders reminiscent of high-end racing catamarans and hulls that are constructed as a single piece of a trilaminate rotomolded polyethylene. In addition to being super light—all-up weight is just 242 pounds—the hulls are nearly unbreakable and are easy to repair if punctured; the heat-activated outer layer actually wants to return to its original form and will rapidly do so. The boat comes with a three-year hull warranty just in case anything goes wrong. The first thing that impressed me about sailing the CX14 is how simple it is. The controls, from the sheets to the halyards to the jib furler, are geared so that young or lightweight crew can handle them comfortably, even in strong winds. Each of the three sails has continuously run sheets, the spinnaker is set and doused with one line, and the jib is furled on a skinny line, so it’s easy to keep track of everything while you’re helming the boat from one of the antiskid-covered amas. Sailing upwind, the boat tacked through about 100 degrees true and made her way easily through the chop, quickly accelerating on each new tack. The long tiller arm felt a bit awkward when I was sitting inboard and aft of the shrouds by myself, but the extra length will be welcome when hiked out on the trapeze in heavier air. The feedback was sharp, the steering was fluid, and the thick trampoline was comfortable to scurry about on. Setting and dousing the 100ft2 spinnaker was a breeze, and the high-aspect Mylar mainsail was light and easy to handle. 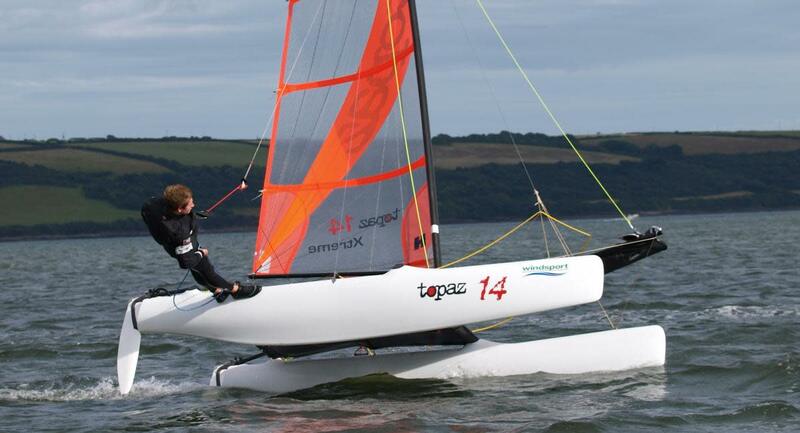 With a choice of four rig options, the Topaz 14 can suit a variety of skill and performance levels. The “School” version has a smaller Dacron main and jib for beginners, while the “Xtreme” version has a larger Mylar main and one trapeze for single-handing. The 14C has a large Dacron main and jib and a twin trapeze, while the 14CX (the one I sailed) adds a spinnaker. All four versions can be quickly and easily rigged and de-rigged and are simple to handle ashore. Where safety is concerned, the reefing system on all four rigs allows for a 20 percent reduction in sail area. Should the boat capsize, the sealed mast, capsize straps and buoyant hulls make it easy to right again. Returning to the docks of the US Sailboat Show, I had very little room for maneuvering and much less room for error. A large trimaran was cruising in behind me, a clothesline was strung beside me, and a massive anchor jutted from the bow of a monohull right next to my slip. Keenly aware of these obstacles, I brought the Topaz in with care and made sure to dock her without any drama. I let out a sigh, then remembered that bit about her ability to reform following a collision. Guess I missed my chance to test it.